Children and a woman sit on a locally made vehicle in Laos as they travel during flooding caused by the collapse of a dam in the Xe Pian-Xe Namnoy hydroelectric project in Attapeu Province. Cambodia's Sekong River hit a water level of nearly 12 meters (almost 40 feet) on Thursday — a height that left 17 villages flooded and forced the local government to rush to find shelter for roughly half the population of the Siem Pang district in Stung Treng province, state news agency AKP reports. According to AKP, Cambodian water and weather spokesperson H.E. Chan Yutha "said that there was no retreating sign and the water kept increasing about two centimeters per hour." The flooding could also threaten a nearly 900-foot bridge that was recently completed in Stung Treng, the news agency says. The disaster started Monday night in Laos' Attapeu Province. That's where a "saddle dam" in a large hydroelectric project failed, causing panic and destruction in low-lying villages downriver. The rush of millions of gallons of water has now caused evacuations more than 40 miles away in Cambodia — and with more rain falling this week, the flooding is expected to continue as the mass of water churns through river systems. The dam in the Xe Pian-Xe Namnoy complex was holding back water from the Xe Namnoy River, which was diverted in April 2015 as part of an ambitious multi-dam hydroelectric plan. "Landlocked Laos is one of Southeast Asia's poorest and most isolated countries, governed by one of the world's few remaining communist governments. In recent years the country has sought to become 'the battery of Southeast Asia' by exploiting its extensive river system to generate and sell hydroelectric power to its neighbors." 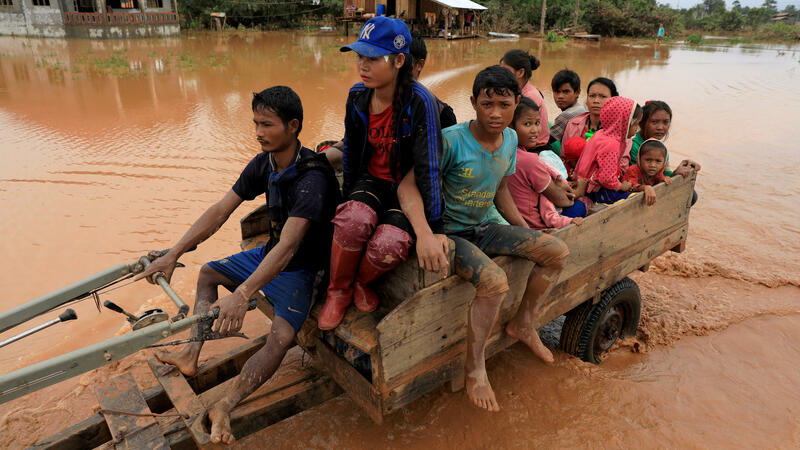 In Laos, 131 people remain missing and the military and volunteers have tried to bolster the relief effort, after at least seven villages were flooded. Prime Minister Thongloun Sisoulith said on Wednesday that rescue workers have been saving people from rooftops, according to the official KPL news agency. The tragedy has raised questions about whether residents were adequately warned, particularly after reports emerged that Korean firms involved in the dam project had raised an alert about a structural problem just one day before the collapse. As of Thursday, the umbrella development company has been silent. "Xe Pian Xe Namnoy Power Company has not made any public and official statements over the incident as yet," Laos' state-run Vientiane Times reports. But after Laotian Energy Minister Khammany Inthirath said the company cannot deny its responsibility — and that compensation and other costs are to be borne solely by the developer — an official told the newspaper that the company will follow the letter of the law and the agreements it signed. A number of countries have stepped in to help ease the catastrophe in Laos, including Thailand, South Korea, Vietnam and China – all of which are sending equipment and personnel to try to ease the crisis.